Discussion in 'UFC Discussion' started by lalo2, Aug 2, 2015. 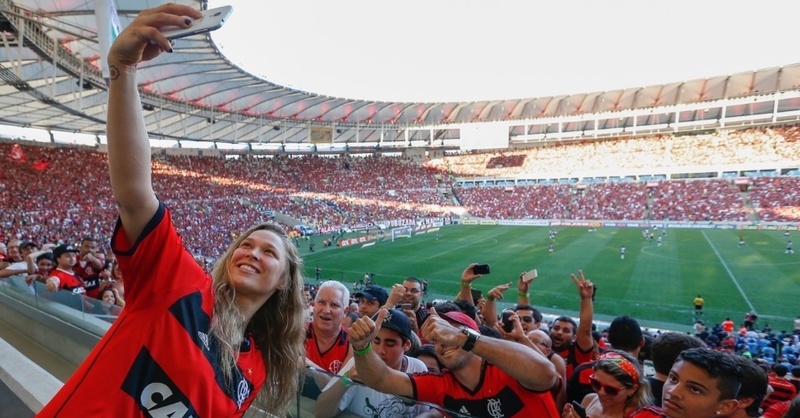 Ronda at a soccer game today in Rio de Janeiro. Good place to catch up on some much needed sleep. How would you feel if you were in front of a fighter who actually deserves to be in the P4P list? I would feel like Aldo probably felt at that moment. Did she drop off the belt yet? lol at Rondas arm being bigger than Aldos. I wish she shared her workouts with us. 2 ppl that dominate their divisions, pretty cool to see. Am I the only one who noticed that she has her hair covering the Adidas logo? Don't smile too hard, Jose...you might hurt a rib..
Haha, nice catch, although Reebok is part of adidas, if I'm not mistaken. oh noo hair is not covering the adidas logo! Oh, was the camera guy in the legit* P4P list?